The accumulated actual rainfall map of the 22nd. has been attached to show the (vagaries) forecasted W.D, somewhat weak and feeble, as IMD has put it. 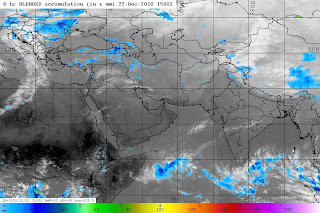 It shows some precipitation in the Ladakh region and some rains in the western Kashmir region. Rain/snow has also trickled into Northern and Central H.P. and extreme western Nepal as predicted. The W.D. is expected to move away eastwards, and weaken or fizzle out. The Cold Wave forecast map put up by Vagaries for 22/23/24 seems to “happening”. The severe cold wave regions shown in the projection are the extreme frigid zone of Kashmir, where Leh has recorded -18c and Skardu in North Kashmir, (North of Drass) was -11c. The “mild cold wave” predicted region of N.India plains, has seen Amritsar slide down to 2.4c on Tuesday, and Delhi touching 5.2c. Parts of N.Rajasthan was cold as Churu recorded 2.2c. In the Central India region, M.P.too was cold, with Gwalior recording 6c, and the hill station of Pachmarhi going down to 1c. Central Mah. 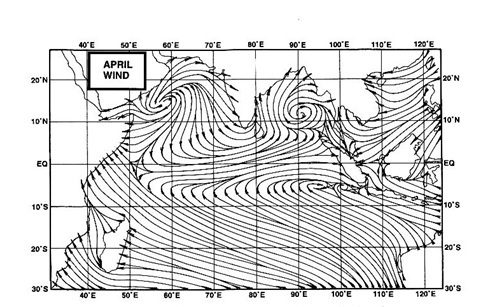 felt the wave, and Jalgaon was the lowest at 5c, Nasik at 6c and Pune and Aurangabad at 9c. In the Southern interiors, an unusual mild cold wave has come as a pleasant though uncomfortable surprise. Chintapalli in A.P. recorded 5.3c, and Gulbarga and Raichur 7c. These areas can expect the cold to continue for another couple of days. Vagaries will put up a temperature forecast map after 24th. When, we may see the nights getting warmer by 2/3c. Precipitation forecast is : All India dry till Saturday. I see no W.D. or system on the horizon for another 5 days at least. As an after effect of the W.D, Pakistan’s Northern region is now witnessing a moderate cold wave. Quetta was -4c and Islamabad went back to 0c on Tuesday. Lahore recorded 2c, and Karachi, as expected, was 11c. Here too, the cold wave should retreat by the 24th. When the night temperatures will be up by around 2/3c, from Islamabd to Karachi in the South. With light precipitation in the extreme west, as shown in the map, the W.D. effect for Nepal is over. Katmandu at 1.6c will see a further fall to 0c on 23rd or 24th. Subsequently, the night temperatures will go up by 2/3c. P.S. I had a comment requesting for more frequent updates. Will surely try to do so. But please note, the Internationa Page, Mumbai Weather and Space News are also very regularly updated. Sometimes, one may tend to overlook these pages. Few weather model forecasting moderate rain for north-west india (including delhi) on 30th dec. and even in central india in 1st week of jan. For junaid, yes, there have been very light fog in mumbai for last few days, but it lifts before 7.30 am.